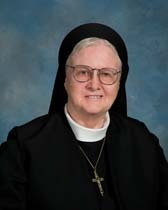 Sister William Eileen Jester died February 22, 2019 at Saint Joseph Villa where she had resided for eight years. Her Mass of Christian Burial was celebrated February 26, 2019 in the Villa Chapel where relatives, friends and her sisters in community rejoiced in celebrating a life of dedicated ministry and selfless giving to others. Born August 13, 1932 in Atlantic City, New Jersey, Helen Marie Jester was the third of eight children born to exemplary parents, George Jester and Ellen Kelly Jester. Soon moving to Spring Garden Street in West Philadelphia, the loving, close-knit family opened their home to their grandfather and aunt. The children attended Saint Agatha School staffed by the Immaculate Heart of Mary Sisters whose weekly shopping tasks were often assisted by the Jester children who frequently enjoyed the benefits of the school playground. Helen’s parents and her siblings often engaged in the many activities sponsored by Saint Agatha Church. It was during her years attending West Philadelphia Catholic Girls High School that Helen Marie keenly sensed the call to religious life along with a strong attraction to the Immaculate Heart of Mary Sisters. It was however the experience of several teaching Congregations at West Catholic that offered other considerations. Helen took a slow, prayerful tact in following God’s will for her. After graduation from West Catholic, she worked for a time at Bell Telephone and Westinghouse. A visit to a Sister of Saint Joseph friend provided insight and clarity to her prayerful discernment. Helen asked Sister Rose Lorena to make an appointment for her to make application with the Sisters of Saint Joseph at Chestnut Hill, an appeal that resulted in her entrance into the Congregation in September, 1952. In April of the next year, Helen received the habit of the Sisters of Saint Joseph and the name Sister William Eileen. Sister William Eileen’s early years of formation, the time before final profession in 1960, were not without a personal struggle. Both parents had died and Sister felt obliged to care for those siblings remaining at home. With the encouragement of her older brothers, George and John, the kind counsel of Mother Marie Estelle and Sister William Eileen’s surrender to God’s plan for her, Sister remained in the Congregation. Her more than twenty-five years teaching first graders, the joy of her life, her years as principal, her office assignment at Cardinal Dougherty High School, her volunteer service as visitor and Eucharistic minister to patients at the Cancer Center of America attest to a life of self-emptying service. Her good work touched souls in the Philadelphia and Baltimore Archdioceses and the Dioceses of Allentown, Charlotte and Camden. Sister William’s ministries extended to other do-it-yourself endeavors. Her resourcefulness enabled her to excel in sewing, cooking, fixing things, enjoying sports and even delving into mechanics. She was a woman of many talents who enjoyed the challenge and satisfaction of it all. With prayer as her mainstay, Sister William Eileen ministered to God’s people. She served them lovingly while always walking humbly with her God Whose loving companionship is hers for all eternity.